In 2010 Proposition 19 was on the ballot in California. If passed, the proposition would have legalized marijuana in the state, and authorized the state government to regulate, control, and tax cannabis. This possibility attracted the attention of Emily Brady, born and raised in Northern California, at that time working as a journalist in New York City. Her original vision was a book on the legalization of marijuana in California. Despite the defeat of Proposition 19, Ms. Brady has found a story: the lives of the people living in Humboldt County, California, the marijuana-producing capital of the United States located a few hundred miles north of San Francisco. The book has a journalistic feel—like an extended version of a story on the marijuana trade one might find in the Sunday New York Times Magazine. 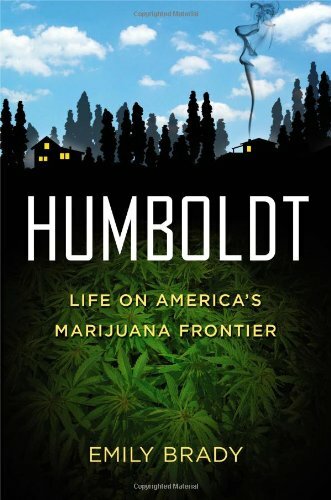 Ms. Brady has traveled with and interviewed four individuals representing different segments of the Humboldt community: Mare, an old-timer in the marijuana-growing field; Crockett, a manager of a cannabis business; Emma, a young woman who has avoided involvement in that business; and Bob, a deputy sheriff who has conflicted feelings on legality and enforcement of laws. Ms. Brady has woven their stories together to suggest the variety of voices in the community, and has also used these points of view to address a wide range of pot-related issues, such as the relative advantages of indoor and outdoor growing; the history of the plant in Humboldt; the criminal elements that accompany any illegal trade; and, most prominently and surprisingly, the business realities of growing an outlawed plant. It turns out that most people in Humboldt in 2010 engaged in the marijuana trade were against legalization. One needs to follow the money to understand why. Simply put, illegality creates scarcity, which keeps prices high. If marijuana had been legalized, Humboldt growers feared, the price would drop, as a result of which the cannabis community to survive would have to move to a state where pot was still illegal; Humboldt County would be decimated. Passions run strong on the issue of the legalization of marijuana. But this book is not political; it does not preach. The author, until the last pages, does not take a strong position on legalization. Rather, the book depicts the centrality of the marijuana industry to the county, as the wine industry is to Napa and Sonoma Counties, and the power of economics in shaping a community culture and individual points of view. In a time when political divisions have created red states and blue states, the story of Humboldt reminds us that our country is further Balkanized by local economic interests shaped by history. Eric Brody is a high school English teacher in Larkspur, California, and a Bay Area Writing Project Consultant.